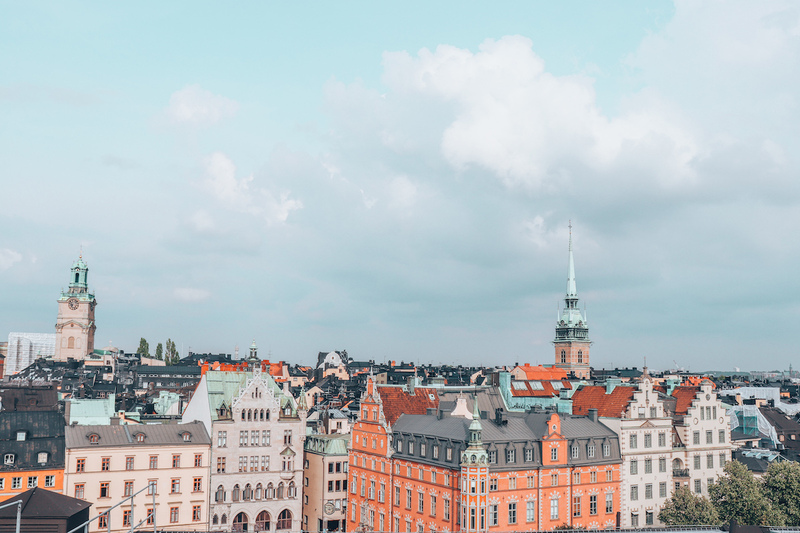 See Stockholm from new heights! 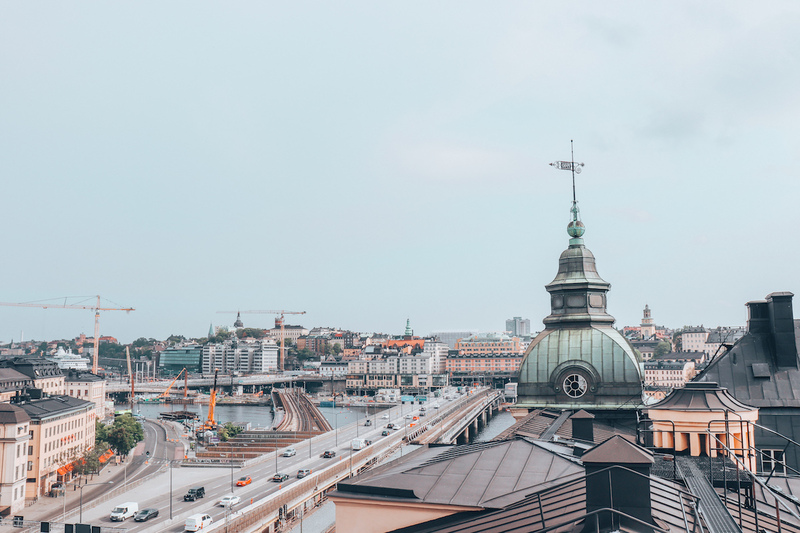 In a city where high-rises and skyscrapers are uncommon, only eight storeys up on a rooftop will give you an amazing, unblocked skyview of Stockholm, Sweden. 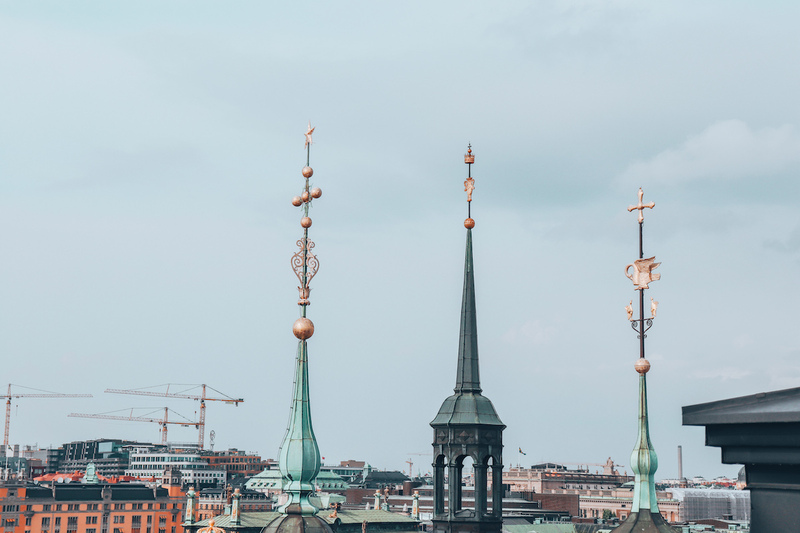 Since 2007, tourists have been walking on Stockholm’s rooftops through a guided tour with Takvandring (translated as Rooftop Tour). From 43m / 141ft above the ground on top of an old Parliament building, you have panoramic views of the city and beyond. We met our guide at the Birger Jarl Statue on Riddarholmen. Together we climbed eight storeys up to the attic of the old Parliament building (elevator optional) and put on our helmets and harnesses. Then we climbed a ladder through the roof onto a platform where we had our first rooftop view of Stockholm. 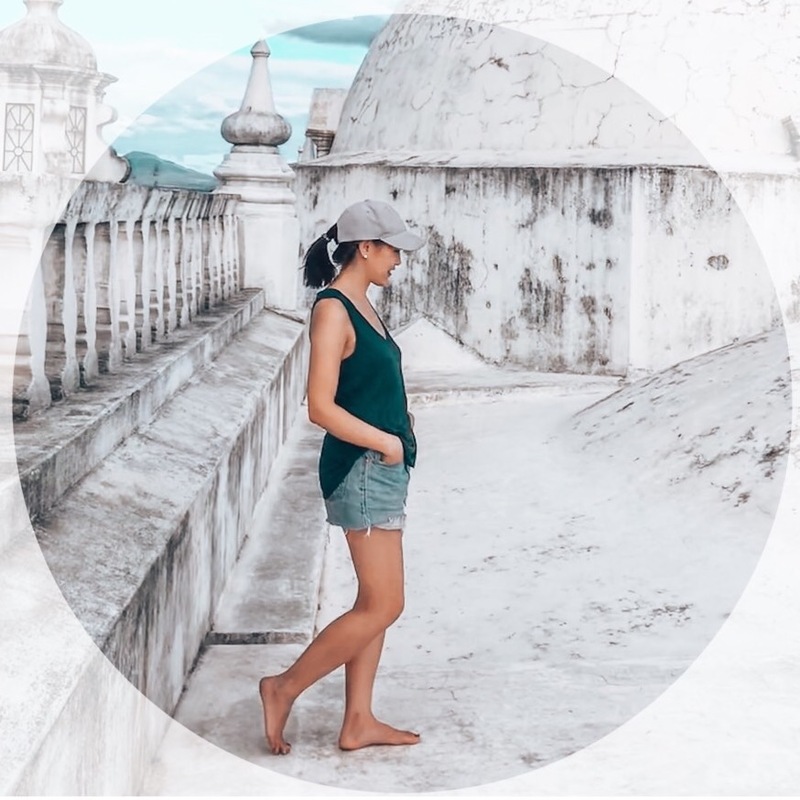 After a brief safety discussion, our “leashes” were hooked to a rail on the ground, and we walked single file on the rooftop track in a clockwise direction on the rooftop. 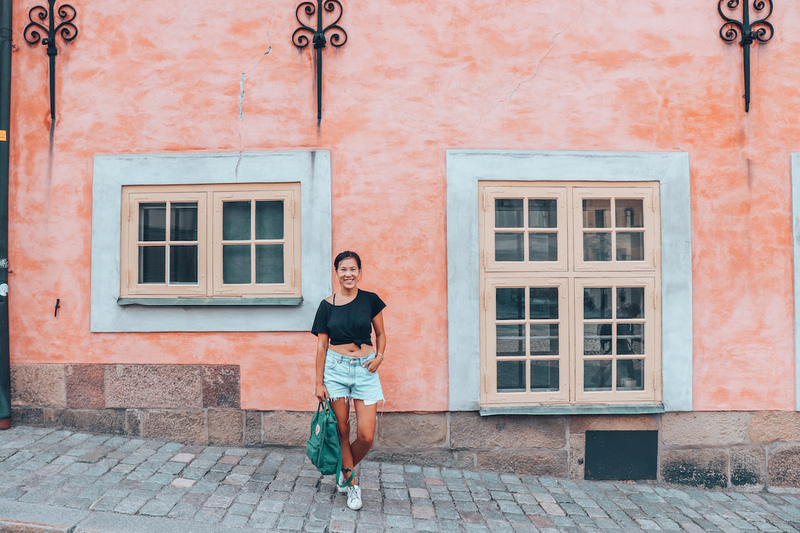 On the tour, three stops are made on platforms for the guide to point out buildings, sights, and tell stories of the history and culture of Stockholm. 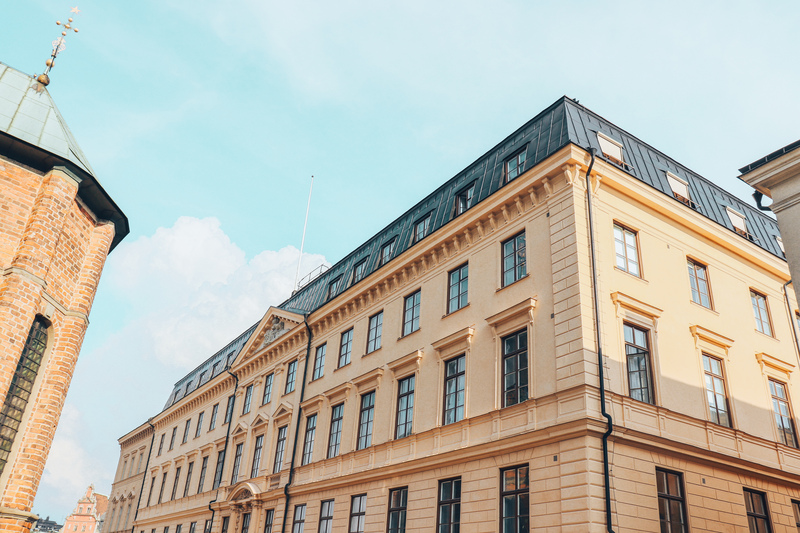 We were pointed out to the penthouse apartment — recently purchased at a record-breaking price — of Swedish entrepreneur Filip Tysander — the founder of Daniel Wellington watches. On the West side of the building, we saw Västerbron “The Western Bridge”, the longest bridge of Stockholm. We were pointed out to “the sad church” Riddarholmskykan, a royal burial church, and a nearby “happy church” for weddings and celebrations, as well as royal buildings, more churches, and islands. The meeting point for the tour is at the Birger Jarl Statue on Riddarholmen near the Stenbockska Palace. As participants are equipped with a harness, helmet, and a “leash” attached to the walking track, the entire experience felt super safe. 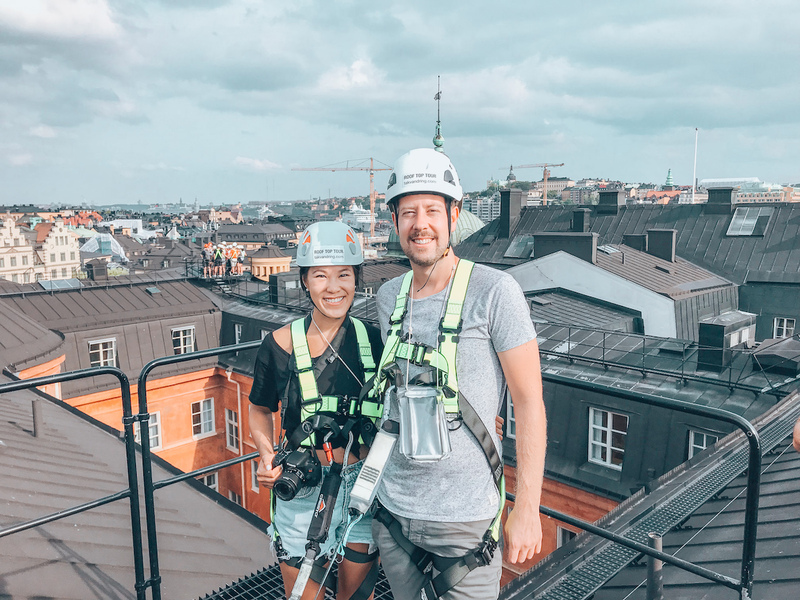 If you’d like to see Stockholm from new heights, get in touch with Takvandring Rooftop Tours and book an experience at takvandring.com. The Stockholm price is 595kr per person ($85 CAD / $65 USD) and includes the guide, safety equipment, and water. The company also offers a similar experience in Sundsvall, a city four hours north of Stockholm for 350 kr ($50 CAD / $38 USD). Thank you to Takvandring for hosting us on this rooftop walk. As always, all opinions are our own on Modern Mix Travel. Fantastic article! I’ve been living in Stockholm for over 2 years and didn’t know about this! Would be keen on doing this. Do you know if they allow kids or did you see any with your tour? I have a son and he is a rock climber and would love this! Thanks for the post.